Find out for yourself why BETAR Focused Vibroacoustic Sound Therapy Systems are the ultimate in deep relaxation! Contact a member of the BETAR family today to schedule your ride. This Tai Chi master's research includes optimized healing responses through music selection and CD design. Experience relaxation and freedom from stress like never before in the most relaxing and soothing atmosphere on Amelia Island. You will leave the Dome renewed, revived, and feeling after experiencing one of five massage/reflexology therapy tables equipped with low volume BETAR: Whisper Edition technology. Discover a serene waterscape overlooking Sanibel and Captiva Islands on Florida’s southwest Gulf Coast. A beautiful haven of gracious hospitality and relaxed luxury with world-class resort amenities embraced by 85 acres of lush gardens. More than a destination, Sanibel Harbour Marriott Resort & Spa is a state of mind. Music Therapy Services of Athens provides quality and meaningful therapeutic and intervention sessions that help children, adolescents and adults achieve personal goals, manage stress, alleviate pain, express feelings, enhance memory, improve communication, promote physical rehabilitation and encourage wellness. Owner-operator Shannon Sausser is a Board-Certified Music Therapist with a Bachelor of Music in Music Therapy and a Master of Arts in Teaching with a focus on Special Education. She has been a practicing Music Therapist and Music Educator for over 10 years, as well as a professional drummer in her band, sursievision. After years of riding the Master Edition in Lakemont, it has been Paula's decades-long dream to bring BETAR to Cleveland and much more of North Georgia. Her Pro Edition system has been upgraded to include the full Master Edition speaker package, the most powerful focused vibroacoustic sound therapy experience available. Very easy to reach from Atlanta and points beyond. Ride the original Master Edition System at KRT, which has been producing resonance energy instruments and devices since 1978. Vibe Studio provides a respite for those seeking relaxation and relief from stress. Enjoy infra red sauna, whole body vibration and vibro-acoustic resonance of the BETAR table. Deborah Champion, a licensed therapist and energy worker is on site to provide an energy massage to enhance the experience. The many counseling professionals at Alliance Counseling provide evidence-based services to help you overcome the challenges you are facing, whatever your age, culture, or background. Standard Edition BETAR systems equipped with Pro 700 amplifiers are located in both offices to facilitate reduction of stress and pain. The Institute of the Himalayan Tradition was inaugurated as a spiritual teaching center by the saint His Holiness Swami Rama of the Himalayas. Their teachers envision life as a journey to fulfillment in body, mind, spirit. They pass on the ancient wisdom of the Himalayan sages as well as modern art and science in classes, seminars, retreats, personal initiations, celebrations, and spiritual guidance. Dr. Bob and Cindy Deering have dedicated over 20 years to researching the effects of stored negative emotional memory on optimum health, concluding that conscious thought patterns, repressed negative emotions, and subconscious belief systems significantly affect the muscles, tissues, organs, and cells of our bodies and, if not addressed, could possibly manifest as dis-ease. Rod DeJong, LMT combines the intuition and energetics of Reiki, Theta and Shiatsu with the specificity of deep tissue and soft tissue release. He has been evolving his integrative bodywork since 1987. Sparbrook BETAR delivers Master Edition BETAR rides for release of deeply held stress and pain. This system is equipped with the all new Pro 700 amplifier. Call to make an appointment today! Dr. Marlowe believes in a holistic approach to therapy and sees a connection between the mind, body, and spirit. From both a vantage point of personal and professional experience, Dr. Marlowe believes in the process of healing, growth, and change. She views the process as a personal opportunity and global responsibility. Judy L. Jones, DC, includes the BETAR vibroacoustic sound system with her patients to help facilitate changes in the body's patterns of holding onto stress, knowing these stress patterns effect us physiologically effecting our nervous system, hormonal system, fight or flight response, digestion and other problems. Dr. Parmar uses her BETAR system to facilitate the health and well-being of the patients of her family medical practice. Peter Fritz offers BETAR as a healing and stress reduction modality. A teacher, consultant and nationally-certified bodywork practioner with a lifetime of success using music for advanced healing, Dr. Sue uses BETAR and the art of tuning fork resonance body work to help clients utilize both sides of their brains across all the states of consciousness. She has a 22 year track record of success with sound therapy systems and has been representing BETAR USA exclusively since 1995. Her Standard Edition System delivers powerful healing results. In most cases the Psycho Physio Center can cure fibromyalgia through simultaneous stimulation of the physical (neurological circuits) and the psychological (long-term memory), allowing the tension centers to relax. Visit Holy Trinity Spa & Health Farm, West Africa's most patronized medical tourism destination, where one is greeted by the sounds of streaming water from the Volta River in harmony with rippling water from a large fountain that instills a sense of calm, tranquil, rejuvenation and holistic health. Healthworks Stress Management uses BETAR to stimulate the relaxation response in clients of this alternative healing center. Because you deserve it! An ideal way to experience Brightlife – the ultimate in relaxation and tranquility at our Ballalheaney retreat in Andreas and a world away from the stresses and strains of everyday life. Through a choice of therapies, Brightlife will help you experience and understand the benefits of relaxation, tranquility and calm. Plunge into a life of joy in the heart and soul at this beautiful nature facility where clean air washes the singing of birds and the babble of the river to every guest. This center offers a pathway to everyday awareness and spiritual teachings through Akashic reading, dream therapy, aromatherapy, Reiki healing, and BETAR. Regain yourself in this place of healing! All of us at BETAR USA are extremely proud of the Far East's first Master Edition system, built through collaboration with our friends at Elegantree. Services available include not only rides on this certified BETAR Master Edition system, but also installation of BETAR systems and products at client residential and commercial locations. 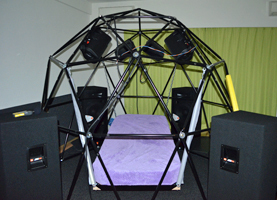 BETAR is a system that aims to release stress from the mind and body by the frequency that resonates with the sound. By leads to relax the body by a low frequency that can not be to hear in the ear, to experience systemic frequency that resonates with the sound, as well as spirit and your body, you encourage to biological energy. Lying in bed, and deep relaxation, you will obtain the stress effect by simply listening to music. All BETAR products are covered by our 100% satisfaction guarantee. Send them back undamaged within 30 days and we will refund your purchase price with no questions asked.